Highlights of the Aug. 21 press conference, with remarks from Emory's Dr. Bruce Ribner and patient Dr. Kent Brantly. Two Americans infected with the Ebola virus while providing humanitarian aid in West Africa have been discharged from Emory University Hospital. The two patients, Dr. Kent Brantly and Nancy Writebol, were the first Ebola patients to be treated in the United States. Brantly, who arrived at Emory on Aug. 2 after being transported by air ambulance from Liberia, left Emory Hospital following a press conference today. Writebol arrived at Emory from Liberia on Aug. 5; she was discharged Aug. 19. Brantly was greeted by applause from reporters and Emory staff as he appeared at the press conference Thursday morning with Dr. Bruce Ribner, who oversees the special isolation unit where Brantly and Writebol were treated. "After a rigorous course of treatment and thorough testing, we have determined, in conjunction with the Centers for Disease Control and state health departments, that Dr. Brantly has recovered from the Ebola virus infection, and that he can return to his family, to his community, and to his life without public health concerns," Ribner, medical director of Emory's infectious disease unit, said at the press conference. Ribner confirmed Writebol's Aug. 19 release and said she had asked for privacy, so her case would not be discussed further. "The medical staff here at Emory is confident that the discharge from the hospital of both of these patients poses no public health threat," he said. Brantly and Writebol were treated in a highly isolated unit that was set up in collaboration with the Centers for Disease Control and Prevention to care for CDC scientists and others who have traveled abroad and become exposed to infectious diseases. "Speaking on behalf of everyone at Emory, we are tremendously pleased with Dr. Brantly's and Mrs. Writebol's recovery, and we are profoundly grateful for the opportunity to apply our training, our care and our experience to meeting their needs," Ribner said. "All of us who have worked with them have been impressed by their courage and determination. Their hope and faith have been an inspiration to all of us." Ribner said that despite public concern caused by "limited knowledge of the Ebola virus, especially in our country," caring for the two patients was "the right thing to do." "We cannot let our fears dictate our actions. We must all care," Ribner said, noting that "as grateful as we are today, our work is far from over." "We are mindful of all of those in West Africa who are still fighting for their lives against this threat and those who are caring for them putting their own lives in danger," he said. "It was the right decision to bring these patients back to Emory for treatment. What we learned in caring for them will help advance the world's understanding of how to treat Ebola virus infections, and hopefully to improve survival in parts of the world where patients with this infection are treated." 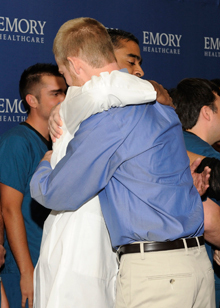 Dr. Brantly: "Today is a miraculous day"
Dr. Brantly hugs Dr. J. Varkey as he thanks the staff of Emory University Hospital for his care and treatment. Brantly then read a statement, accompanied by his wife and flanked by more than 20 doctors and nurses who cared for him at Emory. "Today is a miraculous day. I am thrilled to be alive, to be well and to be reunited with my family," he said. He recalled how, after caring for patients with Ebola in Liberia, he "woke up feeling under the weather" on July 23, "and then my life took an unexpected turn as I was diagnosed with Ebola virus disease." As Brantly grew sicker over the following nine days, "I prayed that God would help me be faithful even in my illness and I prayed that in my life or in my death that he would be glorified," he said. Brantly served in Liberia with Samaritan's Purse, an international relief agency. Writebol worked in Liberia with SIM, another humanitarian relief agency. "Through the care of the Samaritan's Purse and SIM missionary team in Liberia, the use of an experimental drug, and the expertise and resources of the health care team at Emory University Hospital, God saved my life — a direct answer to thousands and thousands of prayers," he said. With tears in his eyes, Brantly thanked Samaritan's Purse and SIM, then turned to thank the Emory healthcare team who stood behind him at the podium. "You treated me with expertise, yet with such tenderness and compassion," Brantly said . "For the last three weeks you have been my friends and my family, and so many of you have ministered to me, not only physically, but also spiritually, which has been an important part of my recovery. I will not forget you and all you have done for me." Writebol chose to leave the hospital quietly and did not appear at the press conference, but Brantly said she asked him to convey her gratitude as well. Brantly asked for respect for his privacy and continued public focus and prayers for those affected by Ebola virus disease in Africa. As of Aug. 20, the World Health Organization reports 2,473 confirmed, probable and suspected cases of Ebola, with 1,350 deaths. "I am glad for any attention my sickness has attracted to the plight of West Africa in the midst of this epidemic," he said. "Please continue to pray for Liberia and the people of West Africa, and encourage those in positions of leadership and influence to do everything possible to bring this Ebola outbreak to an end." After Brantly concluded his statement, he and his wife hugged each of the doctors and nurses who had once had to care for him under the strictest isolation protocols. Amidst cheers and more applause, the couple then left the podium and held hands as they were escorted from the hospital. Taking questions from reporters following Brantly's departure, Ribner said he and other Emory medical staff were pleased by the outcome of the case. "We were very hopeful that with the level of support we can deliver in our facility, that we would have a substantially better outcome than our colleagues practicing with lesser developed health care systems," Ribner said. "Having said that, once it became clear to us that both of our patients were going to recover and recover with very little residual, there was a pretty gratifying feeling amongst all of us." Information learned by caring for Brantly and Writebol at Emory can be used to help those suffering from Ebola in Africa, Ribner said, listing fluid and electrolyte replacement and treating clotting abnormalities as examples. While health care practitioners in Africa may not have the infrastructure to test for these problems, the treatment strategies used at Emory may still help. "We are in the process of developing several guidelines that will be disseminated to practitioners in Africa. … There are things you can do even if you can't measure it to try and improve the outcomes in your patients," he said. Transcript of statements by Dr. Bruce Ribner, Emory University, and patient Dr. Kent Brantly from the news conference held Aug. 21, 2014.